sweet photos of boys at work! Sweet pictures and the perfect title! The Washi tape is perfect! Great pictures too! Love all the washi tape! Precious memories here. I really like the washi tape. Like the washi strips as part of the design. Lovely job! Super use of the Washi tape! I am not a fan of washi tape but this layout is making me think differently!! Cute page, and great papers for this challenge. 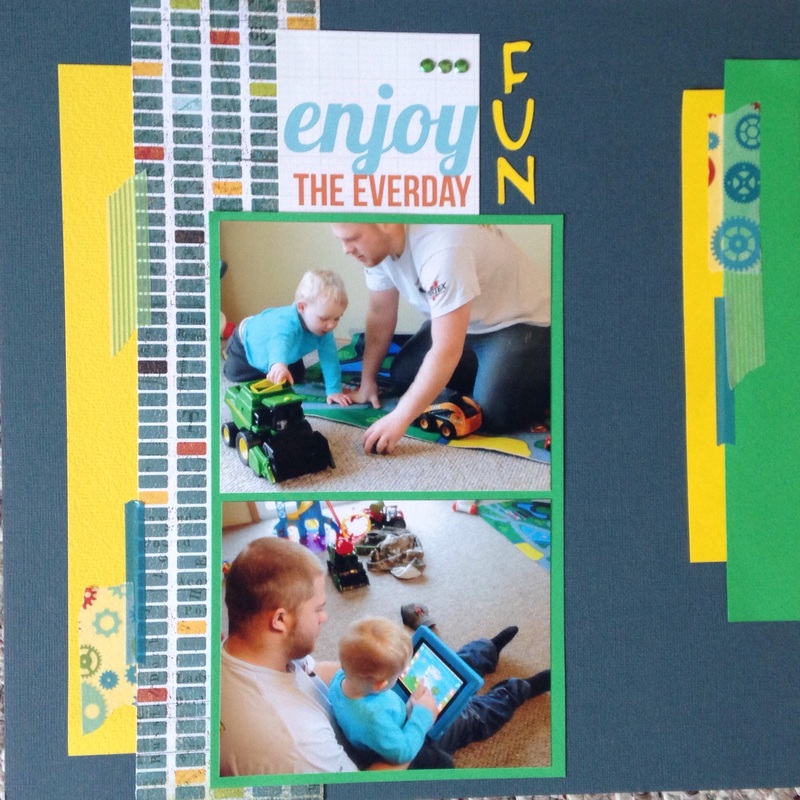 Great use of these colors.. perfect for a playful boy page. Those pictures are so sweet. Terrific page. Love your design and paper choices. Looks like fun! Great colors and use of the washi! Love the colors and totally want the gear washi tape!!! Great boy lo and colors! Fun colors and happy page! Love your photos and the different perspectives. Great fun and colorful pattern papers and washi tape! Love the washi and bright colors! Great father/son page. Everyday happenings that will not be forgotten. Love the deeper colors. Such wonderful photos of special time with Daddy! Great lo and a true treasure! love the primary colors and the washi tape. GREAT lo. Sorry, I got so excited about the gear tape I didn't mention how cute the pictures are and love the green and flashes of yellow. Love the gear washi tape!! Great for masculine and little boy layouts!! Love the washi tape and the design! Cute! love the bright colours and the daddy and me time!